, a German writer of high character, was born Nov. 25, 1738, at Ulm, where he received his education, and in 1751 produced his first dissertation, under the title of “Historia vitae magistra,” in which he | maintained two theses, the one on burning mirrors, the other on the miracle of the dial of Ahaz. 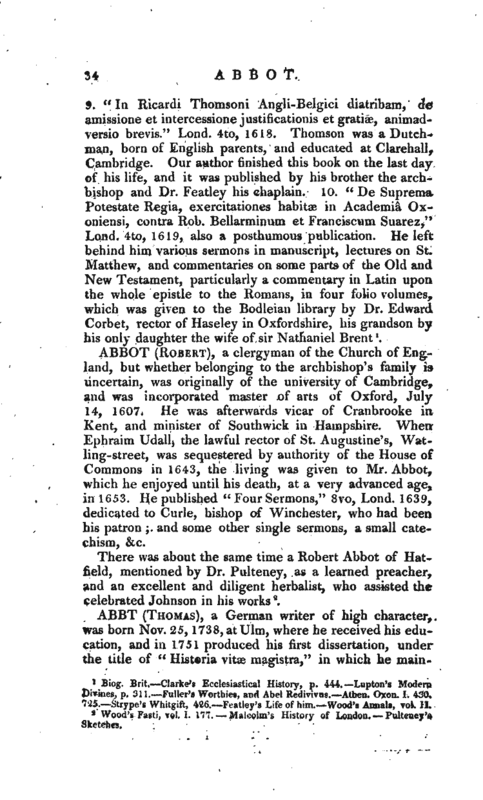 In 1756, he went to the university of Halle, where he was invited by professor Baumgarten to live in his house. Here he published a thesis “De Extasi,” and studied chiefly philosophy and the mathematics; and from 1758, when he received the degree of M. A. he confined himself to these, giving up divinity, to which he had been originally destined. 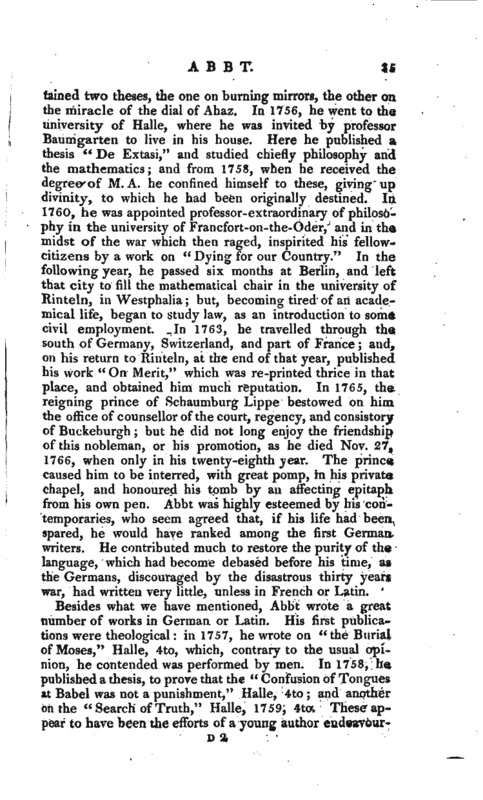 In 1760, he was appointed professor-extraordinary of philosophy in the university of Francfort-on-the-Oder, and in the midst of the war which then raged, inspirited his fellow-­citizens by a work on “Dying for our Country.” In the following year, he passed six months at Berlin, and left that city to fill the mathematical chair in the university of Rinteln, in Westphalia; but, becoming tired of an academical life, began to study law, as an introduction to some civil employment. 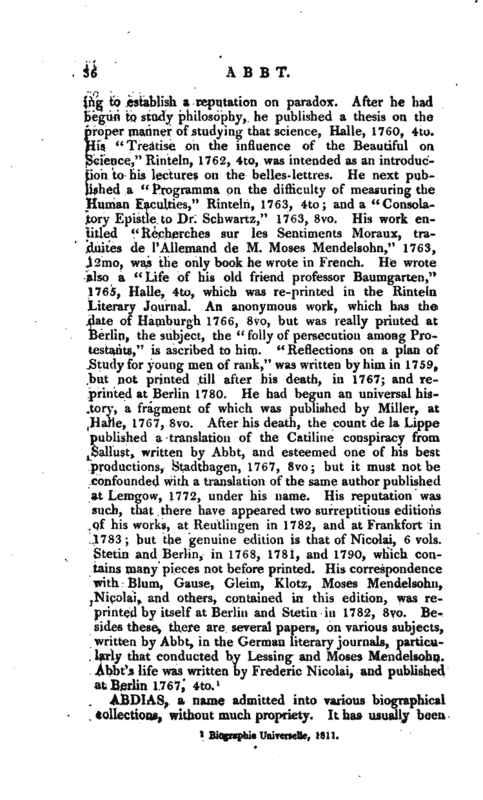 In 1763, he travelled through the south of Germany, Switzerland, and part of France; and, on his return to Rinteln, at the end of that year, published his work “On Merit,” which was re-printed thrice in that place, and obtained him much reputation. In 1765, the reigning prince of Schaumburg Lippe bestowed on him the office of counsellor of the court, regency, and consistory of Buckeburgh; but he did not long enjoy the friendship of this nobleman, or his promotion, as he died Nov. 27, 1766, when only in his twenty-eighth year. The prince caused him to be interred, with great pomp, in his private chapel, and honoured his tomb by an affecting epitaph from his own pen. Abbt was highly esteemed by his contemporaries, who seem agreed that, if his life had been spared, he would have ranked among the first German writers. He contributed much to restore the purity of the language, which had become debased before his time, as the Germans, discouraged by the disastrous thirty years war, had written very little, unless in French or Latin.